The Princess Switch (2018) is a Christmas romance film made and distributed by Netflix. The film is directed by Mike Rohl, more well known for directing TV shows such as Supernatural and Shadowhunters, and stars Vanessa Hudgens in two separate roles. The Princess Switch focuses on two people, Stacy and Margaret, who look exactly alike yet live completely different lives. Margaret, who is about to marry into royalty, wants to live a normal life for a few days and therefore asks Stacy, a baker from Chicago, to swap lives with her right before the marriage. With the spirit of Christmas, magic and joy consumes the film as the girls swap lives and experience the other side of life. This film seems like a clear interpretation of other previous films. There are aspects of The Parent Trap here, and that is obvious from the fact that one actor is playing two characters that look exactly alike. There are also clear inspirations from The Princess Diaries (a film I loved when I was a kid) and the Netflix Christmas film last year, The Christmas Prince. Whilst it may seem off-putting that this film is taking influence from a lot of our beloved films, it may be a smart move. We all know going into this film that this isn't going to be a critical darling. This is the sort of film that would be shown on the Hallmark channel. However, those films have a specific charm that they spread the idea of love and celebration of Christmas and they have a target demographic. By following the same formula and spreading the message of love, this is aimed to be a small, fun film that anyone can stick on and enjoy. Yes, this isn't a great film in terms of technicality. The writing, direction and story is very basic and simple. This is not a film that I would watch at Christmas every day, and there is no way that this is going to be a classic. However, I will say that this is indeed a nice little film that succeeds in what it wanted to do and is indeed very sweet and charming. Everyone in this film does fine with their performances. Hudgens does great showing the two different personalities of her characters, but the writing doesn't allow anyone to shine beyond what they are there for. The characters all seemed cliche, but then again that seems to be the point. There are certain storylines that are hinted at and would have added dimension to the story, like Stacy's ex, but after the start of the movie they become less relevant. It is a shame, because it would have fleshed out the characters and the story a little bit more. There really isn't too much I can say about this film that is not already obvious. Just like The Christmas Prince last year, this film is simple, sweet and also a bit cheesy. However, this film has an audience and they will absolutely enjoy it. Despite being a Christmas film, it does not go overboard with the idea of Christmas aside from a few traditions, and I like that. 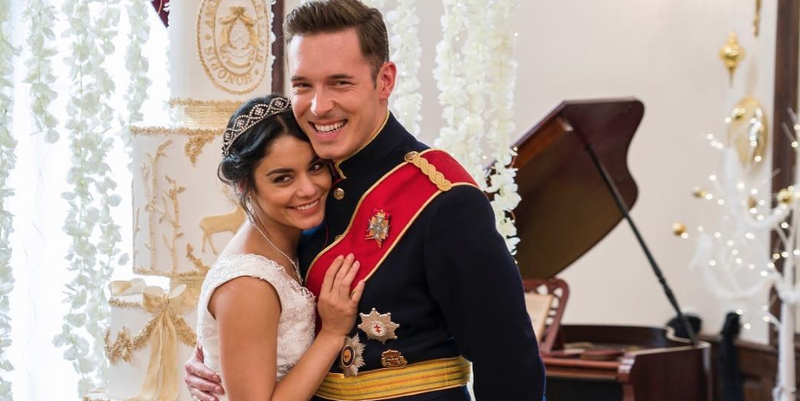 It does seem better quality than the Hallmark Christmas movies, and I think that has to do with the charisma that Hudgens brings to the film. If you don't like the typical Christmas romance flick, you will not like this film. It is every bit as cheesy and destiny-filled as the rest of them are. However, if you do enjoy those films, then I think you should check this one out. It is only 100 minutes and will pass away the time and bring you a bit of festive cheer. Normally these sorts of movies don't do much for me, but even I liked this film by the end. Have you seen The Princess Switch yet, or do you plan on watching it? Or, is The Christmas Chronicles the Netflix Christmas hit this year? Let me know in the comments below and I will check them out. Stay tuned for next week's Christmas film review as I re-watch my favourite Christmas film of all time, Home Alone.